The first thing that the interviewer asked him was what led him into public service and he immediately mentioned a very specific particular moment. It was a speech given by Adlai Stevenson at the Princeton Senior Class Dinner of 1954. He actually mentioned it several times and said it was the best call to service that he had ever heard. I haven’t had a chance to read it, but if you want to take a look, it is here. And that leds to an absolutely fascinating technological aspect to the publication of his book. 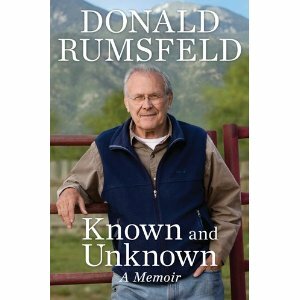 They have scanned in over 20,000 documents supporting this book and these papers are all available at www.rumsfeld.com. As you are reading the book, you can actually look up on the website any of the documents that are endnoted – to read the entire content for yourself. That is a very exciting, and gutsy, thing for him to do. I was quite impressed with that transparency. Of course, presumably any of the smoking gun documents mistakenly got fed into the shredder instead of the scanner! Oh well, everyone makes mistakes. Most surprisingly and unexpectedly, I found him to be quite charming. He was funny and a times a bit self deprecating. I had expected him to be harsh and wooden – but he was actually anything but. So, to build on that last thought. It points out the necessity of forging real fact-to-face civil relations with those with opposing viewpoints. I believe that there is a physiological reason that this is so important. As a society, the fact that we are dependent on getting information from television and internet video creates a real problem. These media fool us into thinking that we are experiencing reality – at a distance (tele-vision is literally, distance-vision). But this is not real reality. Not only do these forms of viewing present people literally in two-dimensions, on some level they give us a false sense that we are experiencing that person as if we were with them far away. But we do not get a full-dimensional experience of that person – instead we get a sort of fun-house mirror experience – what we see is indeed going on, but there are many elements of a real experience that are missing (smells, affect, real tone of voice, what is going on off camera, etc.) As a result, there is a separation that allows us to paint those that we disagree with in a much more dehumanized absolutist light. Things are either black or white, good or evil, right or wrong. Nuance is lost – and even worse – human-ness itself is lost. I hope that we will all make an effort to meet our “enemies” face-to-face. Hopefully, that will be one small step towards civility in this society.